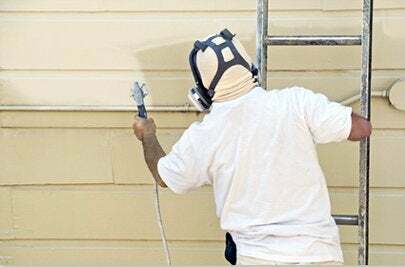 Use a power sprayer to cut days off your next big paint job. You can rent a sprayer from a home center for as little as thirty dollars a day. If you’ve got your work cut out for you, you can buy one for anywhere from two to eight hundred dollars. They’ve even got cordless hand-held models now if you want freedom from carts and hoses. Sprayer nozzles generally allow for four- to ten-inch spray patterns, so you want to use even, steady strokes that overlap each other. Start at the bottom and work your way up to get the underside of clapboards or shingles. Once you get the hang of it, a sprayer can help you finish the job ten times faster and look better than if you’d used a brush or roller. The only hitch is, you’ve got to follow the manufacturer’s instructions for cleaning every part thoroughly when you’re done with the job, so it works just as well for the next one.